The language – I kept having to stop and write down one-liners, so superb is Newton’s command of prose. The setting – a careful rendering of Sydney unlike any I’ve read. It’s refreshing to read a book of the city one has grown up in, so finely evoked in its sense of place, weather, character and idiom. Newton mentions many things I can identify with, from the man made of tyres along Sydney Road as one drives down to Manly (long gone, probably), to the waterfront of Greenwich Point with its oil terminal – as well as places I’m not so intimately familiar with, like the multicultural suburbs of the south-west. The characters: I found the detective protagonist’s personal life absorbing, her mixed Irish-Vietnamese background disconcerting (brave of Newton to portray this cross-cultural perspective), and her relationships with others complex, nuanced and believable. Plot: who cares, when you have all these other things so well drawn? But the plot was fascinating. It managed to weave in so many aspects of Sydney life, cultural, historical, political and personal. Pace: this was a page-turner, but not a fast read. I was absorbed and found myself staying up late (and once waking up at 3am and reaching for the book). At the end, I wanted to finish – because in some ways I found the topic exhausting and confronting, but at the same time I didn’t want my journey with the characters to end. Don’t just take my word for it. The Old School has attracted well-deserved rave reviews, including a couple by participants in the #AWW2012 Reading & Reviewing Challenge: Yvonne Perkins and Walter Masson. 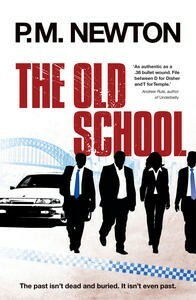 The Old School won the Sisters in Crime Reader’s Choice Davitt Award and the Asher Literary Award, and was shortlisted for the Indie Award for Debut Fiction and the Ned Kelly Award for Best First Fiction. P M Newton The Old School (review) by Elizabeth Lhuede is licensed under a Creative Commons Attribution-NonCommercial-NoDerivs 3.0 Unported License. Based on a work at http://wp.me/pSU9K-9v. Great review – this sounds like a title that deserves a spot on my outrageously long wishlist. Oh, yes! I have found myself doing that with a few books this year – Margo Lanagan’s Sea Hearts, particularly. I’ve even contemplated writing about the prose from the point of view of a writer, too, simply to share my sense of these authors’ technical mastery. Those are the best books for me, when a passage needs to be highlighted or captured and reread. I find myself disappointed when reading and I’ve yet to come across one of those kinds of sentences. Ha! I’ll make you a list of debut authors we can both be envious of (‘…loves company’).